Why is this called "AnySoldier.com"? This started in late July 2003 when we became aware that our son, Sergeant Brian Horn who was then with the 173rd Airborne Brigade, was still living under extremely harsh conditions. His unit parachuted into Northern Iraq on 26 March 2003 (Brian spent his birthday on that plane) and 5 months later was still sleeping on the ground. We never knew this, it wasn't told to us by Brian or any of his Soldiers. It was by a report and pictures in Stars & Stripes! Our family was sending Brian boxes of stuff to help him with his lack of food and simply to show support. We learned that he was handing out a lot of the stuff we sent, he was always asking for more to help the guys he was with. Brian's father, Marty, did 20 years in the Army and being all too familiar with the feeling of non-support, did not want to see his son or the other Soldiers feel the same garbage shown him during the VietNam era. We decided together to send boxes addressed to Brian, but with the added line of "ATTN: Any Soldier" so he would know those boxes weren't for him, they were to be passed around. We contacted all our friends and relatives, using email to keep them informed on what and how to send support. We decided on August 26th to post a web page instead of bothering everybody all the time with email, they could simply check the site when they were ready to help. The domain name of "AnySoldier.COM" was not available then, but "AnySoldier.US" was, so that we became. Brian's Aunt Mary Anne, in North Carolina, contacted a radio station, WBT, and the good folks there got involved, even doing radio interviews with us several times. That changed everything. The folks in the Charlotte, N.C. area jumped at the chance to help the Soldiers of the 173rd and support started in a big way. We then added up to 7 contact Soldiers in Brian's unit to help distribute all the packages. As Christmas neared we saw a need to expand our effort beyond Brian's unit, and on January 1st 2005 we changed the web site to include ANY Soldier. That turned out to be not the best decision as we were told that Airmen, Marines, and Sailors wanted to be part of this successful effort also. And so, now they are. We retain our name in honor of the Soldiers we started this for, who left Iraq in February 2004. Any Soldier Inc. is very proud to be a part of millions of service men and women's lives, and we enjoy the enthusiastic and generous support of folks around the world. Any Soldier Inc. is different from every other effort in a number of important ways; it was started because of a Combat Infantry Soldier on the ground in Iraq who gave excellent suggestions on what to send, it is run by a retired Army Soldier who knows the look on a Soldier's face when they get mail, and when they don't. It is a completely volunteer effort where you have the chance to show your support, in whatever way you want, directly to Soldiers you select, and that is why this is so successful. Any Soldier Inc. will continue to grow, improve, and with your help, make the lives of our Soldiers, Marines, Airmen, and Sailors just a bit better in that they will know we care and appreciate their sacrifice. In September 2004 we acquired the domain name "AnySoldier.com" and started to migrate away from "AnySoldier.us" to help avoid the confusion many folks had over the "dot US" name. By August of 2005 we had aquired AnyAirman.com, AnyMarine.com, AnySailor.com, and AnyCoastGuard.com domain names and developed 5 service-specific versions of the web site (all database-backed). by the United States Patent and Trademark Office. "Freedom isn't free! Just ask Any Soldier !" You select one or more Troops from the Where to Send page. You will notice the Soldier's address includes the line, "ATTN: Any Soldier®" . The Soldiers are all volunteers for this effort, they will see the "Attn" line, and will put your letters and packages into the hands of Soldiers who don't get much or any mail. This effort is 100% voluntary. We provide help on the What to Send and How to Send pages. You send your support, and maybe some stuff, directly to whatever unit or units you pick. PLEASE read the entire web site before you send anything as we want you to be informed and comfortable with this effort. ALL of the names on the "Where To Send" page are military personnel located in areas ouside CONUS (CONtinental United States). All the names are volunteer contacts with Any Soldier Inc., who accept the mail and packages you send them, see the "ATTN: Any Soldier®" line on their address, and pass it on to the folks around them who don't get mail. The number of folks around them is noted on their page, male and female. Note that this IS NOT the number of Soldiers in their unit, it is the number of folks the contact is in a position to help with the mail. The contacts are from the Army, Air Force, Navy, Marine Corps and Coast Guard. And, yes, the National Guard and of course the Reserves. Each contact (if you click on their name) has a page of "updates". The updates are from them telling you something about them and what they may need or want. We ASK them what they need or want only to give you an idea of what to send them, IF you wish to send them something. You are NEVER required to send them anything more than a letter unless you wish to. You will quickly discover there is a huge range of the types of contacts as well as their needs. You may obtain the addresses by simply clicking on the link provided and filling out the form, the address are then be emailed to you immediatly. There is a limit on the number of addresses you can get that that information will be posted on the request form. PLEASE do not use this program until you have read, at a minimum, this page, and the "Terms and Conditions". Every contact is different. Some are writers, some are not. Their updates are not edited, except for a rare slip of security or request for something on the restricted list (usually pork to a Muslem Country). We ask every contact to tell us something about them. They are all required to complete this application. Most follow directions, some not so well. Troops are often like the rest of us, not always perfect. Some contacts use their rank, some do not. This is usually directed by their command. No postal employee can dictate that an address must contain a rank, Street Name, Phone Number, etc... The addresses are given to us by the contact. They probably know better than anyone what it should be. The requests are simply that, requests. As stated often on this web site, THIS IS ABOUT SUPPORT, NOT JUST STUFF. You will note that most all the contacts mention that letters are THE most prized item. Expensive undershirts are nice, but not required. I can tell you for a fact that most Soldiers find it difficult to even ask for support, to list what they need. It's below them. Marines in particular find this really distasteful and most would rather die then ask for help. But they are all learning that THIS IS ABOUT SUPPORT, NOT JUST STUFF, and they ALL appreciate that! Try using our search tool on the Where To Send page. There isn't another one like it anywhere. You can use it to identify what units are asking for and much more. You can't hurt it, so give it a try. You can learn quite a bit by using it. All contacts are required to send updates to this site as often as they can, usually every 2-3 weeks. This protects you, the supporters. We can't be there and verify each contact is even still there. Each contact is required to have an alternate there and we have that person's name and email address. If 50 days go by and we don't hear from the contact, a warning email is sent. After 60 days, the contact is dropped from our "active" list and put on the "Old Contacts" list. We take no pleasure in dropping anybody and understand full well that the contact may be on a mission (I even had to drop my own son once! ), on leave (that's vacation to civilians) or simply couldn't get an email to us. Should the person contact us again, they are added right back on the "Active" list. On the "Where to Send" page are the troop's "updates". If they have a change of address, you will see "Address Has Changed". If you requested their address in the past, you will have to request it again if you wish to send them more items. Sorry, but yes, this does count against the allowed amount of addresses you may get. Are care packages tax deductible? Probably not. The staff at Any Soldier Inc. is not qualified to answer tax questions, so we very strongly suggest you consult with a tax professional. If a donation was made TO Any Soldier Inc., then that IS a tax deductible donation. ALL donations of $250.00 or more are automatically sent a receipt (which the law requires if the donor does release contact information to us) and for any amount if the donor requests it. Donations to Any Soldier Inc. can be done HERE. So, you requested an address and you saw a message that says you were blocked... No worries!! You may have been blocked for failing to adhere to the restrictions of the site OR you failed to donate for using this service. I do NOT have ALL the information. Many donations are done that I have no info on. With the staggering amount of email I deal with (Well over 1,000 a DAY) I don't remember them all. Easy Fix however, simply email me, Support@AnySoldier.com, and tell me what is wrong. I can fix stuff with your help. I can and do block folks without notice only because there is a way to do that. I can't, however, with (396959 blocks as of right now actually), notify someone they will be blocked. Sorry. You do NOT need to donate every time you take an address. How often DO you have to donate? Well, despends. How much does what we offer allow you to do what you do? How much do you want to stay using our resources? Can I do a collection drive? Any suggestions? Yes, several things to consider, though. First thing is to read as much of our web site as possible. It is all there to help you do this properly and safely. Be sure to read the "Let's get started" on the home page, then the "How to Send" and all of this "FAQ" page. Then, pick ONE contact from our site, and send ONE small test box yourself. This is the icebreaker, you will learn a lot from doing this. One of the biggest problems of doing a collection drive is that you really don't know what you are getting, or getting into. Folks with good intentions (most of them anyway) will simply clean out their closets and kitchens and give you stuff you would not dare give your kids. How will you react when you find out that you sent deadly peanut butter products (or whatever)? Consider the liability of sending items you have NO guarantee of their quality or safety. Also, size matters. The best items to send are the smaller ones, not the gallon hair gel tubs for example. So, how to do this right? Simple, pick a 'target'. Either a type of unit or type of request. For example, you have connections in the Medical World. So, use the search tool on our "Where to Send" page and put "Medic" or "Corpsman" in the 'Title' box. Hit that and read what they are asking for. Then you fill that need and you know who you are supporting, why you picked them, and that you send things they need. Or, any number of other 'targets' are possible. "Beanie Babies", "iPods", "DVDs" (Legal versions ONLY please), items needed for the Women Warriors, for the Hispanic, or Black Warriors, ... you get the idea. AnySoldier.com is the only place that has this ability for you to pick who you want to support and just how to support them. One of the biggest problems is postage. Doing a drive you will surely get far more weight then you might think. Even with flat-rate boxes you can figure at least $1+ per pound. This can get very expensive. Be very careful about IRS laws about donations. Asking for donations so you can send stuff to the troops is likely NOT tax deductible, even if you use the information from AnySoldier.com. Of course, you need to discuss this with a real tax professional, which we are not. Then to add to the fun is getting the right size box so that the items don't rattle around (and of course break) and actually putting the boxes together will take a lot of time. A lot of boxes will take a LOT of time. Of course, let's not forget the amazing enjoyment of filling out the completely stupid customs forms. They take a huge amount of time to do, and they were designed by some government worker completely ignorant of military addresses or reality. Want a safe and efficient way of doing this? Pick a 'target' as mentioned above, and let one of our sponsors help you. See them on the "What to Send" page. All of our sponsors offer the best quality, price, and service. They will do the boxing, customs forms, etc. It also removes the liability of sending something bad from you. This should be a major consideration. Can I email the Soldiers? We DO NOT release email addresses, sorry. It is our policy as it protects the contacts from huge amounts of SPAM. We do suggest however that if you wish to email with the Soldiers that you send your email address in your letter or package and let the Soldiers contact you. MANY of them ask that you include your email address in your letter (but again, that is up to you). Can I just mail to "Any Soldier"? The absolutely senseless "Any Servicemember" mail program in the '90s was dropped. And for very good reasons. The requirement now (actually since 9 January 2003, DOD Postal Manual, 4525.6-M, Issue #22093) is that you must address mail to a real address, as in to a particular Soldier. That is where we come in. YOU pick who YOU want to support from our "Where to Send" page and YOU send your support to THAT contact. NEVER, EVER, send anything to "Any Soldier" or to us at Any Soldier Inc.
Can I send homemade cookies/cakes/anything? I make the best in the world! No, not unless you are a direct relative of the Soldier. We warn the Soldiers to not eat anything that does not come in a factory sealed package. This is a really sad sign of the times, but you can understand that for safety reasons it has to be this way. But remember, the reason those things tastes so good is partly because they are made without preservatives. Put that in a box, let it sit for weeks, (especially in the summer) and you can guess what is growing in that box. The Soldiers will throw out any homemade items so please don't waste your time or money sending the most bestest cookies ever made. Here is a good test: Put your homemade items in a box, seal it like it was going in the mail. Put it outside for at least 2 weeks. Open it and give the items to your children/grandchildren to eat. Get the idea? Oh, before you set it outside, then after you get it back, throw it against a wall, see if it survives your packaging. NOT kidding here...it happens, often. Can I just send letters? How do I and what should I say? There is not one thing on this site, or anywhere, that requires you to send stuff. Letters are THE MOST requested thing by these Soldiers. So, all you need do is send a normal letter in a normal envelope with a normal stamp. Tip: If you want, put your email address in your letter, many Soldiers request you do so they can, and prefer, to reply that way. Too easy: like you are talking to a friend, because that is what that Soldier is going to be to you real quick. It is also VERY helpful if you leave your full return address as part of your letter, envelopes tend to get trashed quickly. Can I use this site to complete OUR project? However, you MUST use the address *exactly* as we send it to you including the attention line under the contact's name. Our contacts trust us and we work hard to offer you the most accurate addresses possible. Other organizations gather addresses from anywhere; the woman down the street who knows a girl that has a cousin in Iraq...etc. Our mission is to get support to the troops, and that includes giving supporters addresses they can rely on. Don't waste your time and money on organizations who pass out expired or invalid addresses. Our contacts look for the attention line in their mail. Your project or organization will use the addresses as you get them from us. Do not 'rebrand' Any Soldier®. Can you send me the names of Soldiers who want to get mail? No. I was an Army Sergeant and I can tell you that I don't support this idea one bit. First of all, lists like this are often bogus. "Soldier, sign your name on this list." Also, if a Soldier is really lonely, he isn't about to advertise that. Another reason is that I have seen this backfire in a big way. A Soldier's name is on a list and he has no idea that he is advertised. Worse is when his family is identified as not caring about that Soldier. Not good. Let a Soldier contact you if he/she wishes. There is a new customs form, dated January 2009. Whoever designed the form is either ignorant that care packages actually go to the military or simply does not care. The new form only allows for the listing of 4 items, with the instructions, "Enter a detailed description of each article - e.g., "men's cotton shirts." General descriptions - e.g., "samples", "food products" or "toiletries" - are not permitted." We are trying to contact the person responsible for this disaster for correction. YOU can help! Contact your Congressman and Senators NOW and let them know about this!! Stay tuned. 20 May 2009: Got called back from the US Postal Service office of Public Relations, by Yvonne Yoerger, responding for Sue Brennan. Yvonne shared with me her frustration of the new form, and advised me that due to the changes of control by the Commerce Department, Postal Reform Act of 2006, that was the reason for the new form. She will be sending my concerns up the chain, and we just go from here. "This is to acknowledge your email to the Postal Regulatory Commission, who shared it with our Consumer Advocate. I am responding for the Consumer Advocate. 1. List the first 4 items on the PS Form 2976-A; attach additional forms to list the remaining items. 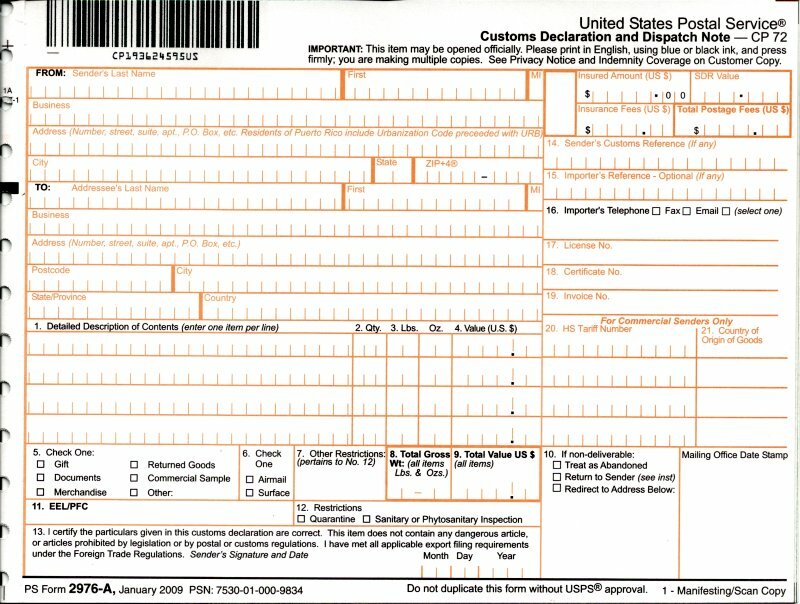 Add these forms along with the original form and insert them in PS Form 2976-E, the Customs Declaration Envelope. (Cross out the barcode on the additional forms). Please note that the following instructions are printed as part of the revised instructions for completing PS Form 2976-A, May 2009 edition: Block 1: ….. If there is insufficient space on the form to list all articles, use additional form(s) as needed. Indicate on the first form (to the right of the barcode) the following: "Additional forms enclosed". Important: Obliterate the tracking number and barcode on subsequent form(s) and place all the form(s) into PS Form 2976-E (plastic envelope). 2. A sheet of paper can be used to list the remaining items in the package and attached to the PS Form 2976-A. Insert the additional sheet along with the PS Form 2976-A into the plastic pouch (PS Form 2976-E, Customs Declaration Envelope). From what I understand of the process you are probably sending virtually identical packages to each soldier on your list. What I would recommend, therefore, is to build a "model package" and have each package contain the same items. As the contents would be the same, then the list of contents would be standardized too, and a copy of the same packaging list could be used as delineated in Option 2, above, for each package. I would recommend a master copy of the list be created in a computer then as many copies as needed (one for each volunteer to use in preparing the package and one to go with the Form 2976-A in the envelope, 2976E) could be printed. After the packages were completed they could be sealed; the Form 2976-A should have "See attached list" written in Block 1. (You would need only one Form 2976-A per package.) The Form 2976-A and the list of all of the contents would then be enclose d in the envelope 2976E and the item would be ready for mailing. 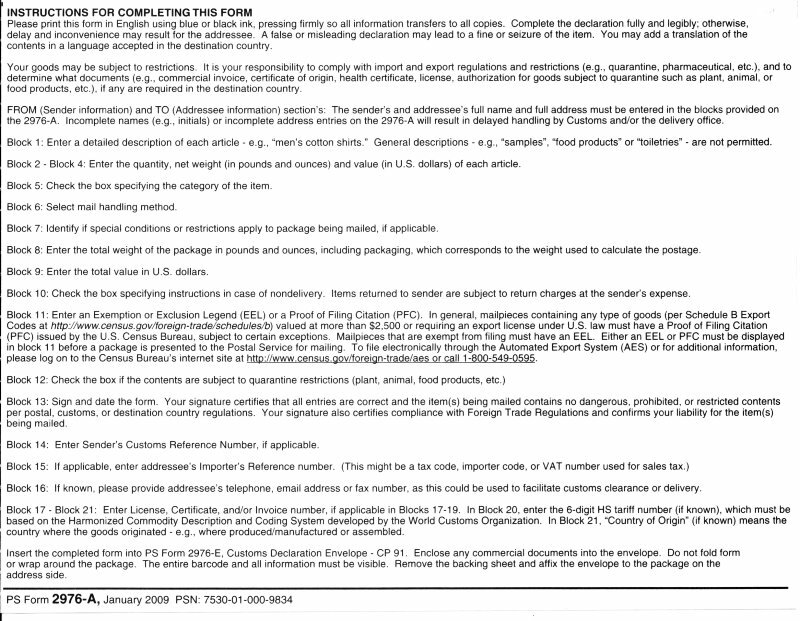 Of course not all of the packages may be perfectly identical so perhaps the "non-standardized" items could be listed on the first Form 2976-A and then the computer generated list could be used to list the standardized contents. I do hope this will prove useful to you. Incidentally we have a number of employees who have been recalled to duty and they, and all of our soldierForm s, are in our thoughts. OK, still a lot of fixes needed but hopefully this is a helpful start. All APO/FPO ZIP Codes have a "B" restriction which states that the custom form 2976-A is required for all mail weighing 16 ounces or more. In addition, mailers must properly complete required customs documentation when mailing any potentially dutiable mail addressed to an APO/FPO regardless of weight. All mail is subject to X-ray so fill out the customs form accurately. Not putting on there that there is an electrical device and putting a few bars of soap in may cause an innocent package to be blown to bits because it looks like an explosive device of some kind. Custom Declaration requirements for APO/FPO addresses are defined by restriction codes, and these are listed in every Postal Bulletin under the "Overseas Military Mail" article and can be found HERE. I'm asked often about Customs opening packages. Yes, they can, and they do. However, if they open your package, they have to send you a letter stating that the package was opened for inspection. Don't want your package bounced back to you? What if your contact is gone? On the Customs Form, in block #10 is a "If non-deliverable" section. Check the "Redirect to Address Below:" and put in what you wish. "Any local Chaplain" is a good one, or "Addressee's Commander" is a suggestion. The Customs forms are available at your post office and you can complete them online HERE. If you have questions about the Customs forms, please ASK YOUR POST OFFICE! Do I get a tax deduction for the money I spend supporting the troops? Normally, no. Donations (monetary only) direct to Any Soldier Inc. ARE deductible. However, we are not tax consultants, not even close. If you are concerned with the tax effects on your support, please consult with a legitimate tax wiz before you take the plunge. Does this include Reserve and National Guard units? Absolutely!!! While on 'active' status and outside the United States, they ARE Active Duty! Doesn't the government give the Soldiers everything they need? I get this a lot, and it is a good question. As the old saying goes, the government is concerned that they get "Beans and Bullets". First, define 'need'. Does your employer give you everything you need to do your job? Then why did you buy that briefcase/laptop/day planner/space heater/lava lamp on your desk? You get the picture, you got those things to make your job easier or better. Also, ever go to your local store and they were out of what you went there for? And you don't even live in a war zone! Some of them do!! Don't Mix Food and Non-Food Contents! Do NOT, for ANY reason, or in ANY amount, include food items in a care package with ANY hygiene items or chemicals of any type. If you want to send a care package, make it only food items or only non-food items. You would not believe how even factory sealed cookies taste when they have lived together in the same package with bath soap for a month in 120 degree heat. Also, since so many folks simply won't repack liquid items in vacuum bags (like FoodSaverTM for example), please just use another box. We get requests all the time that folks NOT send soaps, bug repellent, dryer sheets, air fresheners, detergents, deodorants, (getting the idea?) in the same box as food items. We do not release our contact's email addresses to protect them from being bombarded with junk email. However, many of the troops are asking that you include your email address in your letters and boxes if you would like a reply or thank you. This is of course far easier for the troops that have Internet access. This is completely voluntary on your part and does not guarantee a reply. But it helps. Flat Rate? The cheapest way? As you know, mail is sent by weight. If you send heavy stuff, then the Flat Rate boxes may be the way to go. Information on that is HERE. Remember, you pay postage only to either New York (APO AE or FPO AE) or San Francisco (APO AP or FPO AP) or Florida (APO AA or FPO AA). We get questions all the time from teachers if using AnySoldier.com is a way their students can write letters to the Soldiers or how to go about it. Start by reading ALL the home page, then the FAQ (this) page. It will help a lot if you do your homework prior to using this site or trying to organize any effort to write to the Soldiers. Make it a homework assignment for the students to read the AnySoldier.com web site. We *strongly* encourage that their parents also be involved in this. Ask the students to pick their favorite contact, and write a short note why. Then have an in-class discussion on the web site, and set up some kind of competition on who the best contact(s) are (this can be by a drawing by young students, a paper by older ones, or a debate by even older students) and the class picks the contact(s) the entire class will then support. This really gets the students to not only get behind your idea because they will quickly learn that they CAN make a difference, but will then be smart enough to help you pull off your intended project. With luck, this will spark not only their interest, but may help getting their parents involved. Also, be SURE to read the "Can I do a collection drive?" (#7) above on this page. So you picked an address and the address is bad. It happens, for many reasons. So, what happens to the package? Well, that depends on several things. FIRST: Did you put forwarding instructions on the Customs Form? (see above). SECOND: Did the postal clerk somewhere along the line read the forwarding instructions? If there were no instructions, chances are (and that is NOT guaranteed) that the package will come back to you. "I noted a problem on your website that I wanted to point out. On the Customs Form 2976-A there was a notation to put "Any local Chaplain" or "Addressee's Commander" as a redirect address. The Customs form may not be accepted by the military as a redirect since valid change of address forms filled out by soldiers, sailors, and airmen take precedence over the Customs form. Legally the military postal folks must send those packages back to sender when they have a change of address card." Good to know. This explains why you might get a package back even though you properly filled out forwarding instructions. How do I address the packages? Exactly as shown on the email you will get if you request the address on the "Where to Send" page. How do I add my unit to your site (or my son's/daughter's/husband's/wife's unit)? If you are a Soldier, Airman, Marine, Sailor or Coast Guardsman who wants to be a contact, click here. If you know one (relative or close friend only), please contact them and have them check out the web site and use the form on the "For Soldier, Sailors, Airmen, Marines and Coast Guard ONLY!" page. If the Soldier is unable to communicate via email with us, you may consider being an 'advocate' for them. You need to get all the information required on the application form, complete it (be honest we never want the supporters to be misled), and in the comments section identify yourself, giving your name, email address, and phone (NO worries, your phone number and/or email address will never be made public) if you wish to be contacted to expedite this. Be mindful that you are then responsible to keep us updated on that Soldier and pass on information as to their wants and needs. How do I understand Military Time? It is a 24 hour clock, so starting at midnight, it is "Zero Hours", or 0:00hrs. At 1 in the morning (1 AM to real people), it is 0100hrs (zero one hundred hours). At noon, it is 1200hrs (twelve hundred hours), dinner time is (6PM for you) 1800hrs (eighteen hundred hours). The minutes are just added on, so you finished dinner at 6:45PM, the military did it at "eighteen forty-five hours". We may be tax free, but sadly, freedom is NOT free and neither is this web site. If you send insured or registered, Soldiers have to go to their base camp to get these items and they may not go there very often at all, but this depends on the unit. This is a difficult call, however. Before you send something expensive, we recommend that you ask the folks you are sending to what they suggest. Every unit faces a different situation. However, if it is expensive, insure it! The APO and/or USPS has a theft problem. The scam is someone removing expensive items from packages and resealing the package like nothing happened. Soldiers are actually getting empty boxes! If your package contains an expensive item, insure it! Talk to your postal clerk on the best way to hide the contents of an expensive item to avoid notice and being stolen. Packages that do not call attention to themselves (see notes on Customs form), and are wrapped very well, are less likely to be broken into. I also suggest that you send a letter seperate from the package addressed TO the Soldier (leave off the "ATTN" line) making them aware of the package. It is interesting that there have been no known thefts of insured items. I requested addresses and they never arrived...what happened? EVERY request for addresses IS SENT to exactly the email address you entered on the form, and it is actually sent before you see the page saying it was sent! 1. Did you enter a correct email address? 3. Did you check your Spam folder? 4. If you use one of the free email services (ie: AOL, Hotmail, Yahoo, GMail, etc. ), remember that gazillions of other people do also, so they are notorious for not being the fastest on the planet for delivery. 5. Is your ISP (Internet Service Provider) blocking us? Especially possible if you are using a work email address (which, by the way, we don't want you using our web site during work unless you have your bosses approval), or behind a DoD network (be SURE you are OK to do this!). Check with your network geek or ISP. Another thing to try is a different email address (different email company/provider). If that works, great, now you know the other one is worthless. Just be real careful you don't go over the posted limits or you may find yourself blocked from further requests. Sorry, but that is the best we can do. I spend tons of money supporting the troops!! Why should I donate to Any Soldier Inc.?? Any Soldier Inc. provides several services, via AnySoldier.com, AnyMarine.com, AnyAirman.com, AnySailor.com and AnyCoastguard.com. These web sites offer you features not found ANYWHERE else. Such as YOU get to pick who YOU want to support, we NEVER issue addresses. We have a search tool on our Where To Send page where you can do so many things, like find troops in particular countries, units from different locations, type of units, even individual troops and what they need. Then YOU select them and get the address from us by email and send whatever you wish DIRECT to the troops YOU picked! The web sites Any Soldier Inc. provides were years in the making and are technical marvels. They are also loaded with information to assist you in supporting the troops, such as How to Send support, What to Send, and much more. The money you spend is YOUR decision, we never require any amount to be sent to the troops YOU selected. However, the financial burden you accept has NO effect on the operation of Any Soldier Inc. Any Soldier Inc. has NO government affiliation, but we do cooperate with the Department of Defense. We get NO government funding. Any Soldier Inc. is a non-profit charitable organization, a 501(c)(3) and believe it or not, we DO have to pay bills. Just the servers (which are something to brag about by the way) cost over $600 a month(!). Add to that operating expenses, web site design and production, service and upkeep, computer equipment, etc., so without your donations we can't continue. Donations TO Any Soldier Inc. ARE tax deductible. Stuff you send to the troops is probably not, but don't take our word for that...ask a real tax expert. Donation or charge for addresses? Simple. We do not 'charge' a specific amount for addresses or it would not be tax deductible. We didn't write the laws, but we do follow them. 'Donations' are tax deductible, 'charges' are not. We don't get our knickers in a knot when folks get a few addresses from us and maybe forget to donate to Any Soldier Inc., but if we discover possible abuse, we will block that possible abuser until it is clear what is going on. Isn't it illegal to send mail to "Any Soldier"? NO, it is NOT "illegal", it simply won't go anywhere. The postal service will not accept the package. This is not the postal service's fault, they won't have anybody to give it to as DoD stopped the old program. This is very understandable if you think about it. An APO guy with a zillion packages and he has NO idea what to do with them, get the picture? However, that is not what we are doing here. With our effort you address a letter or package to a full and complete address with the addition of an attention line. That line tells the Soldier that the package is to be handled in accordance with our effort. There is no USPS regulation concerning "Any Soldier", however there is a DOD Postal Manual (DOD 4525.6-M) Issue #22093 dated 9 January 2003, which states, "a. Mail addressed to "Any Service Member," or similar wording such as "Any Soldier," "Sailor," "Airman," or "Marine"; "Military Mail", etc., is prohibited. Mail must be addressed to an individual or job title such as "Commander," "Commanding Officer," etc." Some postal clerks are confused by this so we suggest to avoid any arguments you simply draw a line through the attention line. The Soldier will see this and appreciate your valor at the post office and he/she will still know what to do. We don't advocate getting into an argument with anyone. Yes!! CNN should be so current! This web site has been updated many times a day, every day for ! Is this site only for Americans? More information on this on our "How to Send" page, click HERE. Is this site supported by the Democratic, Republican, or other party? Yes, and it should be. This is NOT a political site, or a site that will make or endorse any political statement or party. This site is about supporting Soldiers. Period. We welcome and appreciate support from everybody. There is not one thing on this site, or anywhere, that requires you to send stuff. Letters are THE MOST requested thing by these Soldiers. So, all you need do is send a normal letter in a normal envelope with a normal stamp. Good ideas: If you want, put your email address in your letter, many Soldiers can and prefer to reply that way. What to write? Too easy: like you are talking to a friend, because that is what that Soldier is going to be real quick. It is also VERY helpful if you leave your full return address as part of your letter (but ONLY if you want to be contacted) and maybe your email address, envelopes tend to get trashed quickly. If your letter is for a Soldier other then the contact you address it to, PLEASE start your letter "Dear Soldier" (or appropriate greeting, like "Airman", "Sailor", etc...) not "Dear SGT Smith" as on the address. The contact passes the mail out to folks around him or her and when that servicemember opens the letter it will feel better without the contact's name on it. If you organize a really large effort such as KMZR, Raytheon, the IRS or others have done, PLEASE do not send more than about 5 packages a day to any one address. The Soldiers simply do not have the facilities for very large quantities of packages. Spread out the sending, please!! The Military Postal Service Agency has launched a new service that allows service members to track down lost and late-arriving packages and mail with an e-mail inquiry. Troops and family members can use the e-mail address, mpsa-mrc@conus.army.mil, to inquire or claim mail that has yet to arrive, and was sent more than 60 days ago. The e-mail inquiry should include a telephone number; e-mail address; rank, first and last name; mailing address; return address; any insured, certified, registered or confirmation number (if applicable); date of mailing; type of container used for mailing; a detailed description of the container contents or any additional information that can be used to identify the item, such as distinctive marking. Upon receipt of the information, MPSA will contact the service member to identify the owner of the mail. If the mail is found, it will be sent to an address designated by the service member. MPSA officials suggest that when mailing packages, troops routinely enclose a card with their address information. In the event the mailing label on the outside is lost or destroyed, the card can be used by MPSA for forwarding the package. My company, school, church, etc. organized hundreds of boxes. How do we send these? FIRST THING ALWAYS: SEND A SMALL TEST BOX!!!!! This is critical as you will learn a LOT on what is involved. Please send no more than about 5 boxes to any single address at one time. Most units simply can't handle a deluge of packages, and it is especially hard on the Soldiers to hand out more than this at a time. Remember, they left their car at home. If you have a really large effort, spread out shipping over about 5-7 days at a time, about 5 packages to each address. This is sad and we hope your company, school, church, etc. does not do this, but check the dumpsters for the next several days to be sure they don't just toss the packages in the trash...we know this happens. And more often than you might think!! My Contact disappeared from the list! What happened?? Check the "Old Contacts (use the drop-down menu on the left)" and "Projects & Others" list. The reason, if available, that the person came off the active list will be shown on their page, emailing us won't get you any more info, sorry. Any Soldier Inc. reserves the right to remove any contact involved in illegal, immoral, or improper activity. A contact may also be removed at his or her request. Once removed, that contact's information ceases to exist on our servers. We also require all contacts to send updates to this site as often as they can, usually every 2-3 weeks. This protects you, the supporters. Of course, we can't be there and verify each contact is still there. Each contact is also required to have an alternate there and we have that person's name and email address. If 50 days go by and we don't hear from the contact, a warning email is sent requesting an update. After 60 days, the contact is dropped from our "active" list and put on the "Old Contacts" list. We take no pleasure in dropping anybody and understand full well that the contact may be on a mission, on leave (that's vacation to civilians) or simply couldn't get an email to us. Should the person contact us again, they are added back on the "Active" list. On rare occasions, contacts may request to be removed from the site for various reasons. Of course, that is done as requested. Overview well worth the read. Send in easy to handle boxes (say under 10 pounds) and wrap like Godzilla will handle it because he will. Shake your box, does stuff move around? Not good, it won't survive the trip. Big, heavy boxes are just asking for trouble. Use heavy packing tape on all corners of the box, and wrap the tape so it goes all the way around every direction of the box. Do NOT use string to wrap a box! A good box example is one Wal-Mart (and I'm told Target) sells for 95 cents that are 11 3/4 x 8 x 4 3/4 inches (#CB-12). These are easy to pack, won't weigh too much and are easy to handle. Mine have averaged about 6 pounds and cost about $6 to mail. Packages must weigh less than 70lbs and be smaller than 130 inches in total length and girth. Please only use strong clear or brown packing tape. Do NOT use duct tape or string. Be sure your boxes are clear of all markings except for those needed for mailing. We strongly suggest you take ALL openings and completely around each direction of the box. You can order Customs Forms, packing materials, etc from the USPS by calling (800) 527-1950. Flat Rate Box Rumor: There are a number of mail clerks that are telling supporters they can not use tape on the flat rate boxes. The Facts: Domestic Mail Manual 709.6.1.4 states that you CAN use tape on the boxes, but NOT to make the box any larger then it's normal size. Current postal rates are HERE. The USPS FAQ on the new rates is HERE. Note that postage to APO AE and FPO AE (E = Europe) is only to NY where the connection to the APO/FPO (APO = Army Post Office)(FPO = Fleet Post Office) is, or to San Francisco for APO AP and FPO AP (P = Pacific), so you don't pay postage all the way to Iraq/Afghanistan. With us since December 2005 you might notice "APO AA" and "FPO AA". This is for units in the Caribbean/South America. Normally. However, due to the nature of some units they may be in Iraq but have an address showing "FPO AA". Mail addresses to "AA" goes out of Miami, Florida. We suggest you do NOT use USPS Express or any overnight service. It will only get to New York or California faster, it will not get to Iraq, Afghanistan or anywhere overseas any faster and costs way too much. We suggest regular or Priority mail. You can get Priority Mail supplies here. Postal regulations specifically state that you CANNOT reinforce any part of that envelope with any kind of tape. Many post offices are very strict about this others are not. Have you had a package returned to you but the address is still on our site? Read this and this. "The Military Mail Scandal", Chicago Sun-Times, by Robert Novak, 12 April 2004. "Troops want to know: Where’s my %&#@ mail?! ", Army Times, 10 May 2004. The above picture is just an example of how your mail may be handled. As you can see, the boxes were not treated with care at all. Both boxes were actually forwarded to the wrong destination (by the military postal person) and instead of being resent to the correct location, they were simply returned to the sender. The box on the left looks like it was run over by a truck. This is shown to illistrate several things: 1. Military mail handlers are not always the most professional. This is a sad fact because in the need for the good people in the military unit to do the unit's mission, the likely not so good ones are picked for the non-essetial jobs like mail clerks. 2. The packages shown were packed by folks who REALLY know how to but the packages still took a beating. Do NOT expect that your packages will be handled with care. This example is NOT to say all mail clerks are bad, not at all, but never expect true professionals in all areas. Like we said in "Packing?" above, "...wrap like Godzilla will handle it because he will." Sadly, yes, there are a LOT of scams out there. Some even have the names of our contacts. Never, ever, continue contact with anyone who you even THINK is involving you in a scam. Please report ANY possible or probable scam to the Internet Crime Complaint Center (IC3). Want to know someone got your letter or package? Know this: There is NO guarantee a Soldier can or will reply to you, no matter what you send. The Soldiers are under no obligation to reply. We can't burden Soldiers who don't get enough sleep, don't eat enough, live out in the open, or whatever, to do anything not related to their job. Sure can't have their leadership tell them to reply either. If you get a reply, it is voluntary by that Soldier and you got lucky. Also, and only if you wish, include your email address as many troops are asking that you do that. "I mean, these guys and gals have other things on their minds, y’know? Like...oh, STAYING ALIVE?" Want Us to pick a Contact for you? Nope, won't do it. No way that would be fair. Sorry. There are a few postal clerks who make up their own regulations instead of taking the time (or maybe lack the ability) to read their own regulations. Want to have some fun? Ask them to show you the regulation that requires what they are doing. First, they get that "deer-in-the-headlights" look. Often with mouth hanging open. Finally comes the string of excuses and they say something like, "Oh, well, we don't have time for that, so we'll let it go THIS time...."
Go to another post office where the clerk may have a positive number in their IQ score. NOTE: NO WAY are all postal clerks are like this. They are people too and have the same DUH-to-weight ratio as the rest of us. We have many reports of postal clerks even helping pay the shipping out of their own pockets for AnySoldier.com supporters!! Work with them, help them by knowing what YOU are doing. Incase you missed it, read Isn't it illegal to send mail to "Any Soldier"? above. Many Soldiers have access to phone systems that can accept phone cards, but NOT ALL by any means! Sergeant Horn (who was the reason we started this organization) spent a year in Iraq, and a year in Afghanistan and has never been where a phone card would help. The Department of Defense Military Exchanges have been authorized to sell the following prepaid calling cards to individuals and organizations who wish to purchase these cards for our troops serving overseas in Operation Enduring Freedom and Operation Iraqi Freedom. THESE are the cards to send!!! Click HERE. PLEASE, ASK the troop's requesting the cards which ones work best for where they are BEFORE you do anything!! Different locations have very different capabilities and a card that works wonders one place may be worthless at another. What are the links in the Where to Send page? AnySoldier.com began to offer a unique feature which should be a huge help to both the troops and our supporters. When you read a Contact's page you may notice some of the words are actually links. Click on that word, for example a contact is asking for goggles, and the link takes you to a merchant that is cooperating with Any Soldier®, knows what is the best product, offers our supporters a great price, handles the shipping, etc. All too often our contacts ask for things that our supporters don't well understand. Using the above 'goggles' example, how are you supposed to know what kind? What color? Where to get them? Or they ask for "DCUs". "What the heck is that??" Unless the contact is very specific, which is rare, chances are you want to help but don't know where to start. The links are not made by our contacts, they are made by us. It is an 'automagical' computer thing. Merchants that really know what is best for the troops work with Any Soldier® by offering the right stuff, giving the supporters a good deal, and help support Any Soldier®. Do you have to buy the items from the links? Simple answer: NO, but we suggest it. Some of the items requested by the contacts are very expensive. Any Soldier® and our contacts NEVER want you to spend money you don't have or are uncomfortable with. Remember, these are requests, not demands. There are many supporters out there with the means to buy these things and they do. Never stress over buying expensive stuff for the troops. Remember, the letter you write IN the box is far more valuable then whatever is in the box. Every time. "This effort is 100% voluntary." If you want to send the best, our merchants will help you do just that. What are the Military Ranks? What the troops write for posting on the "Where to Send" page is sent by email to our Support Team. ALL "updates" are reviewed for possible OPerational SECurity (OPSEC) problems and if found are marked with 'XXXX'. This includes new "contacts". This is NOT an automatic process. It is far too important and sensitive to allow that. We post what the troops say, we do not correct their grammar or spelling, because we kant spel either and don't wish to change anything...these are very real people. The "updates" have been posted every day of the year, without fail, and have been for ! Each Soldier has his/her own description page on the "Where To Send" page, and on it there is a link to show you any specific restrictions to that Soldier's address. Obscene articles (prints, paintings, cards, films, videotapes, etc). Bulk quantities of religious materials contrary to the Islamic faith. Items for the personal use of the addressee are permissible. Check the USPS site for exact information. If you use this site to send anything prohibited or illegal to any of our Soldiers, you will regret it! Any Soldier Inc. and the Soldiers cooperate fully with the F.B.I. to investigate all violations. Each Soldier's page has "restrictions to this address: Here (4*)". Click on the "Here" and it tells you what you can't send. If you aren't sure about something, DON'T SEND IT! Please, do NOT be afraid to send stuff. Easy test: Would you send (whatever) to your mother? What does 'DOD' or 'BN' or other acronym mean? The military, and the government in general just loves acronyms. HERE is a good place to see what they mean. Of course, there are some that the government won't give you so try HERE for others. - Army stands for "Ain't Ready to be Marines Yet"
- Marines actually means "Muscles Are Required, Intelligence Not ESsential"
What is better, one big box or a bunch of little ones? The Any Soldier Inc. effort is about support, not just stuff, and it is 100% voluntary. You send what you want to whoever you want and it goes direct to a 'real' Soldier. No middleman involved. With that in mind, we strongly suggest tailoring a box for an individual Soldier, it really is the thought that counts and the stuff just helps. However, you can do whatever you like. What is the most critical or best thing I can send? Your SUPPORT! This is NOT an attempt to resupply the military, or fix every logistical problem. What counts here is the morale of the Soldier. Send a letter or a new tank, they both help, but a Soldier that knows he/she has the support of the folks at home will use that tank far better than without the support. We will continue to do our best to list the items requested by the Soldiers. Again, this is not an effort to get you to spend a bunch of money, it is about you sending support to those who give us the freedom to express our thanks for our freedom. Why are you not listed on "AmericaSupportsYou.mil" web site? But we are...As of 1 June 2006 AmericaSupportsYou.mil accepted AnySoldier.com. Again. President George W. Bush wrote THIS to Any Soldier Inc.
23 September 2005: Our thanks to the staff of "Stars and Stripes" for inviting Brian and Marty to their offices in D.C. to meet their staff, a tour of their facilities, and a great lunch. 12 June 2005: "Miller Salutes Sgt Brian Horn, May's Unsung Hero of the Month"
12 June 2005: "Care packages are always appreciated, but sometimes they can be hit or miss"
24 March 2005: "200 Soldiers read to their kids from Kabul"
22 March 2005: "Kabul Soldier Reaches Volunteer Program Milestone"
29 January 2005: "Web site provides 'any Soldier' care package option"
Stars and Stripes (PDF version, local copy) (original link, may not work). 4 January 2005: "Program brings parents home to kids on tape"
14 July 2004: "Any Soldier Inc. Shows Support for Deployed Troops"
Why didn't you answer my email? If you use Earthlink SpamBlocker, or other email filter that blocks every email sent to you and I have to request your permission to reply, that isn't going to happen. If you send somebody an email and want a reply, then allow it. If you ask a question already explained in this FAQ, then you won't get a reply. Sorry. Why don't you have more units listed? Well, we are doing pretty good! We constantly get contacts and they are posted when we confirm their status. If you know a Soldier who would like to be a volunteer contact for us, have that Soldier go to Soldiers Apply Here! and apply, or email us at "Support@AnySoldier.com" and we will take it from there. All a Soldier has to do is understand the Any Soldier® effort, actually be stationed outside the United States, provide some information and keep in touch to provide feedback. Why is there a limit on the number of addresses we can get? Most important was to stop merchants, so-called clergy and even a high ranking politician from abusing our site. They were getting tons of addresses and sending advertising, trying to 'save' and convert, and even sending anti-war material to the troops. Some people seem to miss that each of our 'contacts' serves a number of other people. So, no need for so many addresses. Some people also routinely ignore that we survive on donations. Countless organizations (you might be surprised at who some of them are) were stealing our addresses, and even selling them(!) and not helping us at all. This web site depends on YOUR donations. We don't charge for addresses, but without your donations, this site ends. Some people think that sending support to the troops is what keeps this site going. It does not. Donations can be made here. This site is about support. This does not mean carpet-bombing with junk. It is a letter, maybe even in a box, addressed to a particular Soldier, Marine, Sailor, Airman, or Coastguardsman, that will change the day of that Warrior. I can tell you for a fact, that a simple act like that may not only save the life of that Warrior, but affects the morale of the entire unit, making them more effective and survivable. We want them home. Standing up. ALL of them. We believe you do too. Why not have a registration service? 1. Remember, AnySoldier.com is about support, not just stuff. If a Soldier requests something, it is for his folks. Meaning more than one. But what if it is for an expensive item, like a laptop or microwave? Good point, then you realize the life expectancy of anything Soldiers use. I can tell you from experience, there is nothing, not even your 3 year old child or 16 year old son, more destructive then Soldiers. They don't do it on purpose (most of the time), it is a side effect of the macho world. Also, one microwave used 24/7 by one platoon (30-something Soldiers) is a tough life for any poor microwave. NEVER buy an expensive item. NEVER buy a cheep item. Buy in between, and send two (but, ONLY if you can!). 2. You check off a requested item and the USPS or APO pulls the sock-in-a-dryer vanishing act on the item. 3. I have a saying, "There will ALWAYS be bottom feeders". There is no doubt that 99.9% of the users of this site are really good folks. Problem is that leaves those bottom feeders willing and able to screw up all they can. They exist, trust me. I'm not meaning only the punk with no life trying to hack anything it can, but folks who mean harm to our Soldiers. Able to spoof sending all the items requested, then the Soldiers don't get anything. Why not work with (fill in the blank) Company for a better deal? 1. This is about support, not just stuff. We advocate that sending a letter is more important then a box. Don't have to believe me, you will see this mentioned time and time again in the updates that the Soldier's make in their updates. If we generate a huge resupply of any missing items the contacts are requesting, we miss our goal. It is far more important for you as an individual to show your support then some company sending tons of stuff. 2. We can't. Any Soldier Inc is a non-profit charitable organization regulated by the IRS. One thing we are not allowed to do is unfairly compete with for-profit companies. We *could* make a deal for, say, Under Armour® shirts. They are the most requested T-shirts and are very expensive. Under Armour actually did agree to work with us so we could offer them to supporters at a huge discount, and we were excited about that. BUT, the IRS won't allow it because we would ruin all the companies that sell Under Armour by taking away all their business. So, out goes that idea. Will I get a thank you from the Soldier that gets my package? We hope you do, but we do not guarantee it. The Soldiers are under no obligation to reply. They can't be. We can't burden Soldiers who don't get enough sleep, don't eat enough, live out in the open, or whatever, to do anything not related to their job. Sure can't have their leadership tell them to reply either. If you get a reply, it is voluntary by that Soldier. However, if you want to really increase your chances of getting a reply, simply pre-address an envelope to yourself, a few pieces of paper, and maybe a pen and put them in your package. No need for a stamp on the envelope. In your letter to the Soldier which you also put in the box, ask him/her to drop you a quick note or more and ask if there is anything in particular you can send. Many of the troops are asking that you include your email address in your letters and boxes if you would like a reply or thank you. This is of course far easier for the troops that have Internet access. This is completely voluntary on your part and does not guarantee a reply. But it helps. 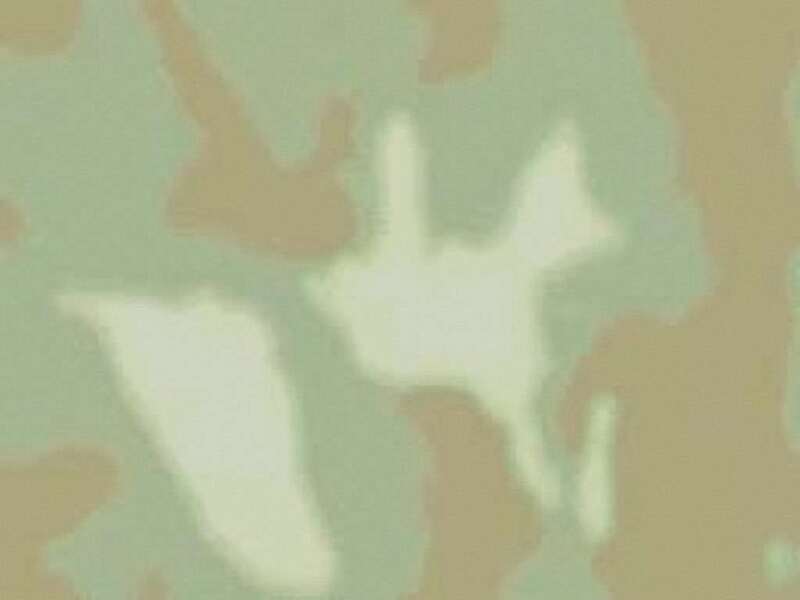 What is the 'XXXX' doing in the troop's updates? ALL updates are sent by email to our Support Team. The Team reviews the updates for possible OPSEC (OPerational SECurity) violations and in places that may be a problem, we simply replace it with 'XXXX'. To help confuse the facts, we always use 4 'X's, so if a contact says something like, "I have 5 people in my unit." or says, "I have 5,000 people in my unit." always using the same 'XXXX' hides the troop strength. We do this for unit locations, types of equipment, etc. The updates are then posted, they never show up automatically. We do NOT edit for spelling, vocabulary, etc. What and how they write is what you see. (Note: If you are having trouble with the numbering on this page, and have Internet Explorer (IE 10 or better), then it is a CRM issue that is fixable. Click HERE.